Saying goodbye to Laos was not something I had looked forward to, but moving on to Cambodia was a very exciting thought. After a short boat ride from the 4000 Islands and an even shorter tuk-tuk ride out to the main road, a bus arrived to take us to the border (5km) and then on to Siem Reap. I have noticed that with each border crossing, my stomach lets me know that something major is underway, but once again, everything went quite easily. A couple of hours into the ride, we were overtaken by a petrol truck as we approached a single lane bridge. It didn’t make it back into its lane soon enough and smashed into the railing of the bridge, destroying the driver side wheel and axle. 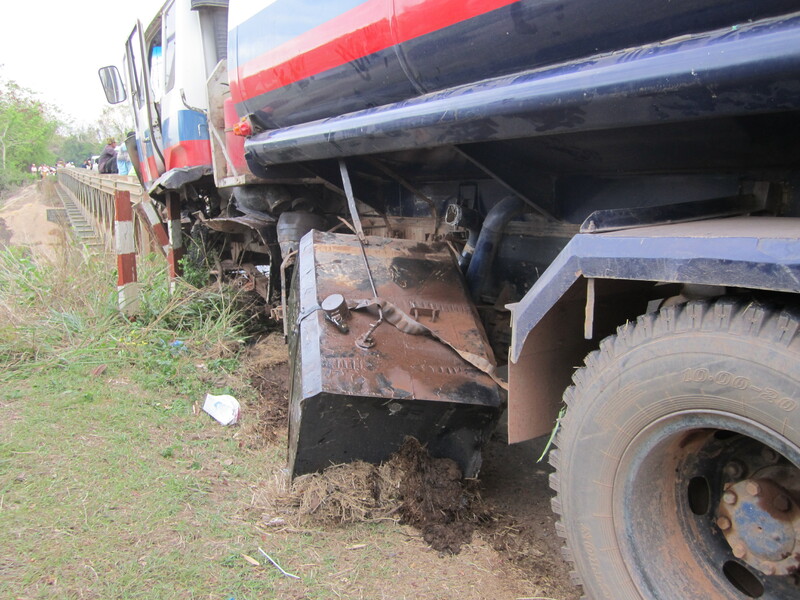 A crowd quickly surrounded the truck and began a group effort to pull it to the side of the road. Luckily, a crane happened upon the wreck and within an hour, we were on our way again. We arrived in Siem Reap late that night and got a tuk tuk to the backpacker area know as Pub Street. The next morning was a glorious sleep-in day before grabbing some breakfast and heading out for day one at the Angkor Temples. It was about 10:30am when we started out so we hired a tuk-tuk for the day and headed to the smaller temples, leaving Angkor Wat and Angkor Thom for the next day. As it was a weekday and we were at the less popular temples, there were very few other people around and we pretty much had free run of the place. On the way to the first temple, our tuk-tuk passed through a stone arch with stoic faces crowned with lotus’ and I was already in love with the place. 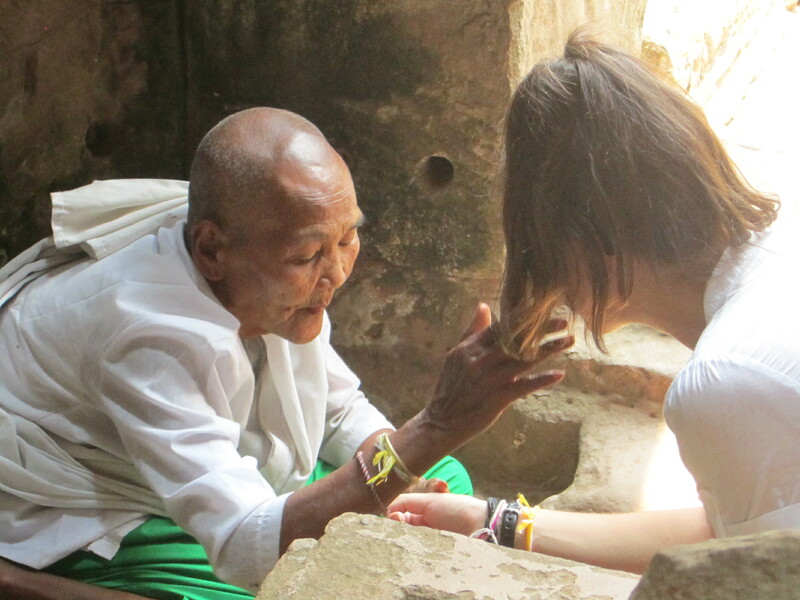 While wandering through Preah Khan, we happened upon an elderly nun sitting in a corner giving good luck blessings to those who stopped to visit with her. She wrapped a small bit of cord around my wrist, said the blessing and touched my cheek with a sweet smile and a nod. This added an additional layer to the magical atmosphere and I found myself having a difficult time believing it was real. The day continued on this way ending with a delicious outdoor dinner of Cambodian food and taking a tour around the local market. 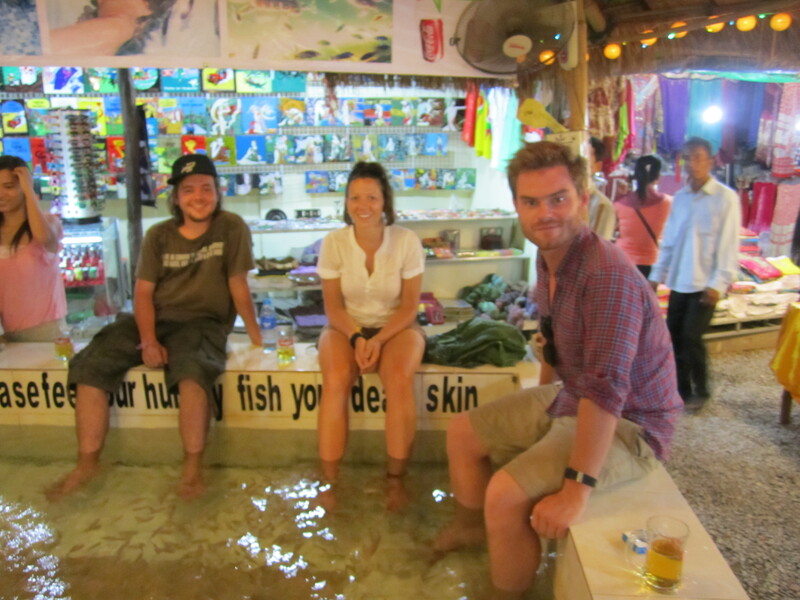 While there, we stopped and had the “fish massage”, where you sit on the edge of a pool filled with fish, drop your feet in and wait while the fish devour all the nasty skin (poor little guys had a feast off feet that have spent 3 months in sandals). 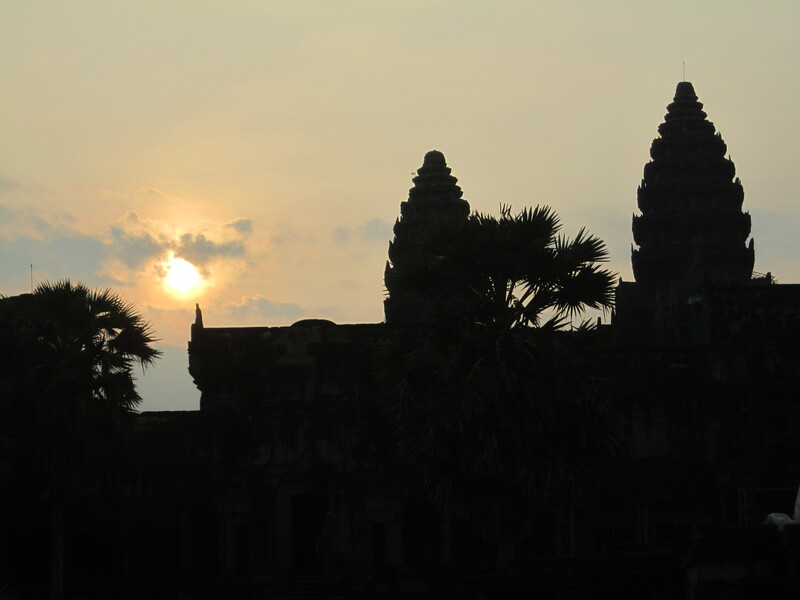 The next day, we got up shortly after 5am and raced to the temples to watch the sunrise over Angkor Wat. We spent another awe-inspiring day wandering through, around and over the temples. I even managed to overcome my numbing fear of falling to climb the silly-steep steps of Tep Pranam. We finished off with a visit to the temple used in Tomb Raider before heading back to town, indulging in some delicious stone-oven pizza and revisiting the market. The next morning, we parted ways with Tom and Stefan and I were off to Phnom Penh. We spent an emotional day and a half there, before Stefan departed for Bangkok, but that day deserves its own post. However, while there, I met Anthony from Australia who was off to the coast for a few days. As I was only to be in Phnom Penh to get my visas for Vietnam and China I decided to head out with him until they were completed. We caught a bus to Sihanoukville and a tuk-tuk to Otres Beach, which turned out to be a collection of beach huts, restaurants and lounge chairs with very few people and very little garbage (which does seem to be everywhere). The next few days were spent roaming the beach, playing pool on tables that made the game very unpredictable, and hanging out with a fantastic group at Joe’s Happy Birthday Beach Club. We also took a private boat tour to 3 beautiful surround islands to do some additional beach time and some snorkeling. While floating in the ocean after ages of swimming with the fish, I ended up swimming with a massive jellyfish. Anthony had already been stung, and I had just finished remaking how ugly the mark was when I felt something rough on my arm. I completely freaked out and tried to swim away, jumping on Chris and yelling and laughing and getting stung on the other arm and on my lower back…OUCH!!!! That would be my last swim before heading back to Phnom Penh to pick up my passport (with my new visas) and head to Kampot to rejoin the group and head to Rabbit Island. Unfortunately, the people responsible for getting us to and from the island turned out to be quite shady and sneaky and ended up leaving a bit of a foul taste for the island. Although it had its frustrations, I still had a great time with Anthony, Chris, Dan and Gen. After 2 days on the island, it was time once again to head off to the border and begin my discovery of Vietnam. 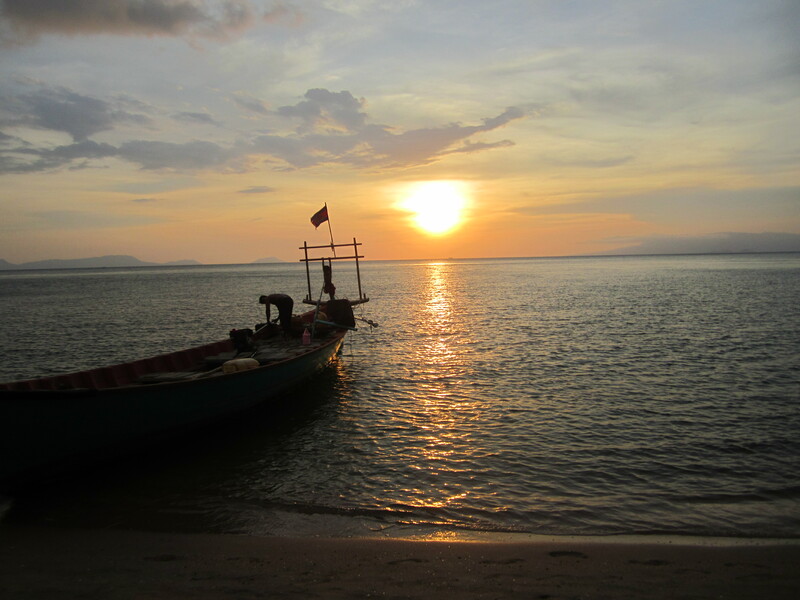 I ended up only spending 12 days in Cambodia, but they were awe-inspiring, perspective changing, full of kind people and meaningful lessons, and only a little frustration…which I think is a great recipe for enhancing the quality of life! Some really beautiful pictures! Can’t even imagine what it would have been like to see in person! forgot to mention how crazy your jellyfish sting looked! OUCH! you are a tough girl, sure you barely felt it! lol! Hi Kerri, Hope the jellyfish bites are OK. Sounds like you had a rough ride!!! Glad to hear it all worked out well. Cant wait to hear all about your life lessons.